Are you as excited as I am for a season of warm weather, flowers, and outdoor fun? 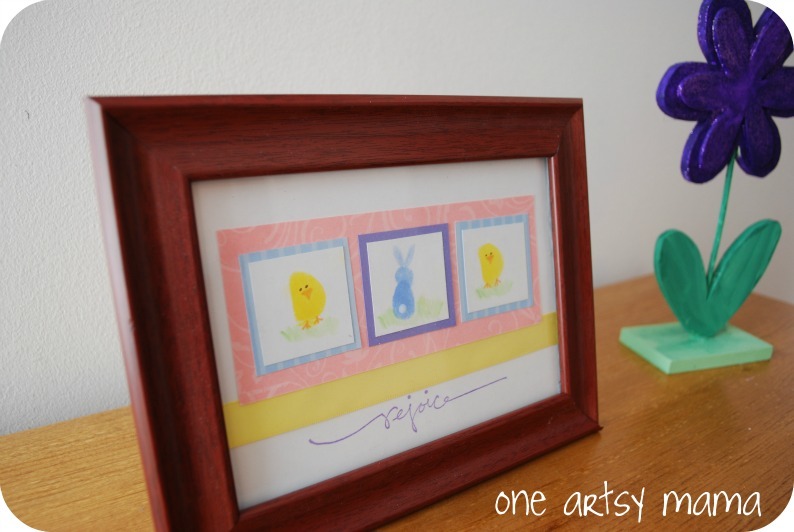 In honor of the first day of Spring, I thought today would be the perfect time to share this fun little framed art piece Little Crafter helped me make! 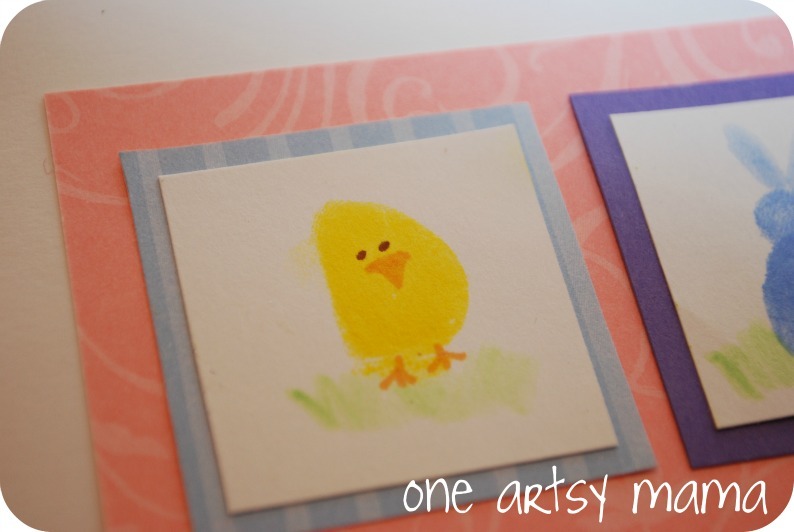 STEP 1: Press thumb into yellow ink pad and press onto 1.5″ cardstock square. Repeat. We did a few extras just in case. STEP 2: Use markers and/or blender pens in ink to add eyes, a beak, feet, and grass around two of the yellow thumbprints/baby chicks! 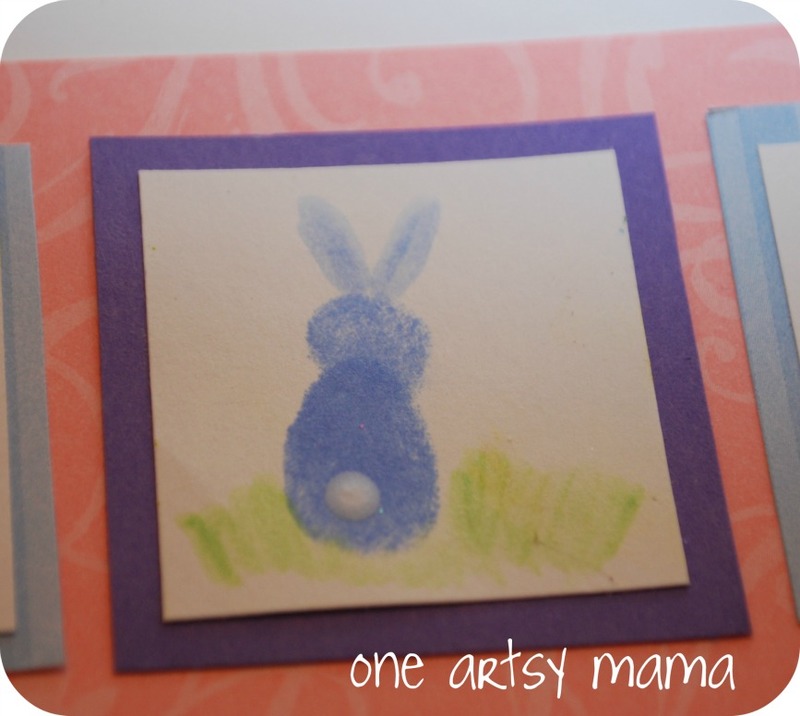 STEP 3: Make a blue thumbprint on another 1.5″ square. Add a print of the index finger on top to make a head, then use markers and/or blender pen to add ears and grass. We made a tail with a dab of white paint. STEP 4: Mount the white squares on colored 1.75″ squares and glue them on a larger background strip. 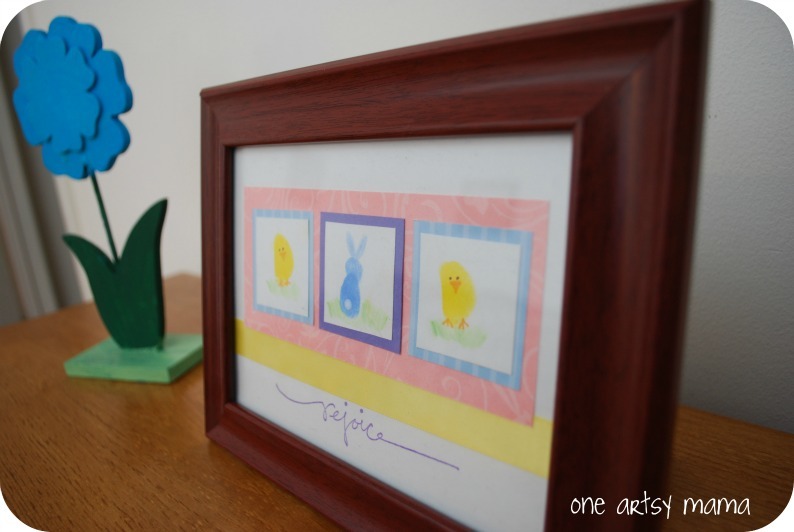 STEP 5: Add word stamp and ribbon, then frame! ﻿We put ours on a little table in our dining room along with two wooden flowers from Michaels that LC painted for me. It’s official, this Artsy Family is ready for Spring! PS: Click here to see our original “pin”spiration! PSS: Be sure to check out all the giveaways still running! This is so cute! 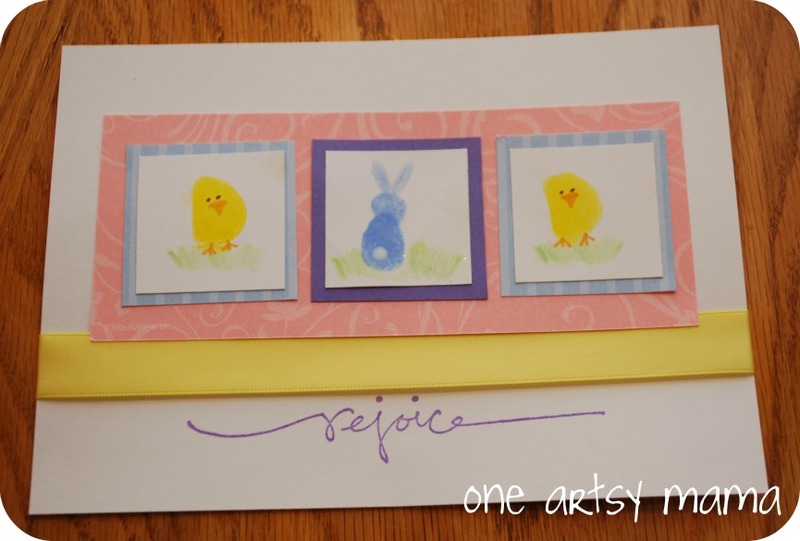 This would be a great way to send Easter cards! I’ve got to pin this one for the future 🙂 Thanks Amy for being so crafty! Super cute! I love that your little one helped you make it. So cute, Amy!! I had been thinking of doing something like this today as well. Once again, I absolutely love it. You’re so crafty!! I’m a new Linky follower! This is great. I’m in charge of crafts for my son’s 3rd grade class next week. Guess what we’ll be doing? I have a new blog if you’d like to linky follow back. It features vintage linens and the occasional devotional. Too Cute….I might have to do this with my preschool kids at church!! This is adorable, and such a fun idea! I’m a new follower and would love to have you stop by my brand new blog and follow too, if you’d like. My first link party/give-away is running now through Saturday. I hope you’ll come and link up! Saw this cute print over at a link party and had to come take a look. This lead me to read your whole series on How to Grow Your Blog and found it so interesting. I gained a lot of good information as I have one of those small blogs who is trying to do just that. I pinned it and will be coming back. ADORABLE!!!! I love it. I think we may need several of these around our house. Thanks for sharing with us at Link It Up Thursday.